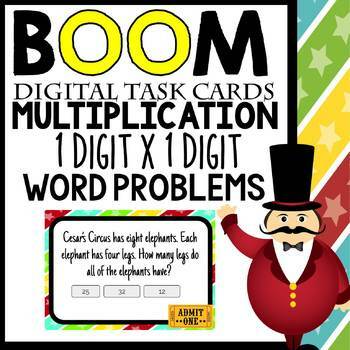 This listing provides the owner with access to my Single Digit Multiplication for Beginners Interactive Digital Task cards hosted on BOOM! Learning. If you are unfamiliar with BOOM learning, it is an amazing program that allows students to complete task cards using any internet-ready device. The purchaser of this product will be provided the direct, and secret link to these cards. From there, you will be able to create a FREE account to add your students to, and assign them this set of task cards in your classroom. This set of cards is designed for students to use to practice their skills with single digit multiplication in word problems. There are 20 individual interactive cards, each containing a word problem and three multiple choice answers. These make an excellent learning center, homework assignment, or substitute teacher activity. All you need is your secret link! Please be assured, BOOM learning will change the way you use task cards in the classroom! No printing, no laminating, and no grading required! The system does it all for you!